(2 June - Cropchoice News) -- Advanta now says it will pay British farmers who planted conventional canola contaminated with low levels of glyphosate-tolerant seed. Advanta, which is a joint venture between UK-based Zeneca and Cosun, a Dutch company, had been resisting calls to make payments to the approximately 600 British farmers affected. But no viable market could be found for the contaminated crop. Quoted by Farmers' Weekly, a company statement today does not admit liability; but says "After detailed discussions of other alternatives, Advanta has now determined that… the only practical course of action is for farmers to remove these crops." 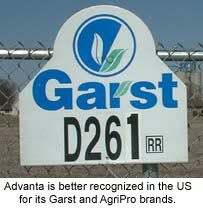 Advanta is better known to US farmers by its Garst and Agripro brands. Advanta also owns Interstate Seeds, a distributor of sunflower, canola and sugar beet in the northern plains states. Details of the compensation have not been worked out. British farmers' preliminary estimate of their loss is about 4.5 million dollars. According to Farmers' Weekly, independent agricultural consultants, loss adjusters and farmer groups will be asked to propose a settlement. The British news says UK farm groups are cautiously optimistic, pending satisfactorily working out the details of a settlement. Advanta had already tacitly agreed to compensate a smaller number of French farmers who planted the Canadian-produced Hyola 38 variety. There, and in Sweden, the variety was ordered destroyed. Advanta's intent to settle in the UK will increase pressure for similar measures in Germany, where more farmers were affected.